Clarets striker Sam Vokes was not risked with an ankle problem as Burnley won both friendly games with Conference North opposition. And James Tarkowski picked up a hip injury in the 3-2 win at Alfreton Town. But neither are expected to be significant issues moving forward, with Burnley stepping up their preparations on Tuesday night at Preston North End. Burnley won at Alfreton with a hat-trick from Andre Gray, while the other half of the squad earned a 1-0 success at Kidderminster Harriers thanks to a Robbie Brady free kick. Boss Sean Dyche said, after the game at Alfreton: "The main thing at this stage is fitness. "Tarky came off, we don’t think it’s too serious, he had a bit of a tightness in his hip anyway. "Longy (Chris Long) came off as a precaution as well, we think that’s a kick on the foot so that shouldn’t be too serious. "The main thing was to try and get the two groups as many minutes as we could, so I’m pleased to get a lot of minutes into these players." On Wales forward Vokes, he explained: "He got a knock on his ankle, it’s nothing major but at this stage we’re being ultra cautious. "Like with Tarky, he gets a knock get him straight off, Ben (Mee) gets a knock and get him straight off, that’s what it has to be." 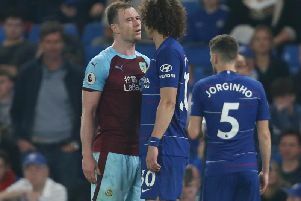 Several of Dyche's players got 90 minutes in only their second pre-season outings, and he added: "It was something we thought about it the last couple of seasons, to try and get an early 90. "That’s why we split them this year to make sure we got a lot of minutes into players early in pre-season. "They’ve come back really fit, but players want to lock in that 90 minutes. We might mix up over the next two games, but for these two games we wanted to make sure that a lot of the recognised first team players are getting a lot of minutes."